Elsewhere, in the Dark Continent, Kenya is seeing the light of the day! Literally! Thanks to the efforts of Evans Wadongo! The young Kenyan’s invention, the MwangaBora- a Solar Powered LED lantern, has brightened the lives of many already. Deepak Shir in conversation with the man, a CNN Hero 2010 Nominee. The MwangaBora (Swahili for “good light”), is essentially a Solar Power LED Lantern- a low-cost, high efficiency replacement to kerosene powered lanterns. So, is the MwangaBora a “Green Idea”? “Definitely”, says Wadongo. “A litre of kerosene burnt produces about 2.6 kg of soot, which is basically raw carbon emitted into the environment. And on an average, about four litres of kerosene are burnt per week in a normal rural household. So, you can imagine the amount of carbon we are able to eliminate from the environment in a year using the MwangaBora. The MwangaBora also holds tremendous potential to positively impact the Kenyan economy. A litre of kerosene costs approximately a dollar. So in the long term, people can save money otherwise spent on kerosene. The money can then be used to set up some small scale industries like poultry farming, fish farming, and bee keeping. These small scale projects will eventually assist in injecting money into the Kenyan economy. Also, by not using kerosene, the fossil fuel imports into Kenya can reduce. The MwangaBora has a shelf-life of 8-10 years. The batteries (which come from China and UK) need replacing after three years. The recharging of the LEDs in the MwangaBora is done through sunlight. The solar panel charges the batteries. Three hours in effective sunlight would suffice to charge the batteries fully. A fully charged lamp can go on up to eight hours of usage time. Despite the visible success of the lamp, Wadongo admits that getting people to understand the model is a challenge, since the major recipients of these lamps are the illiterate rural families. Finance is another area of concern, especially in the years to come, when the technology will have attained full sustainability. Moving on, Wadongo throws light on SDFA (Sustainable Development For All-Kenya), a non-profit organization, which was started in 2006. Wadongo is the chairman of the Board of Directors of SDFA. The organization focuses mainly on projects dealing in Environment, Education and Economic empowerment. The MwangaBora, tag-lined as, “Use Solar – Save Lives”, symbolizes all that SDFA stands for. Events such as road-shows and sports tournaments are organized, which provide the kind of platform needed to reach out to the community and educate them on environmental conservation. As regards to developmental activities, a biogas plant in the Nyanza province near Kisii in Kenya will soon be underway. Setting up solar plants at a larger scale at health centers and schools, and making villages completely solar-powered are other focus areas. Another goal is to have distributed 100,000 lamps by the year 2015. The SDFA also seeks to expand globally, starting with SDFA, USA. In the next five years, the organization is hoping to spread out into regional offices, and thereafter into other countries like Uganda, Tanzania, Southern Sudan and Nigeria. Their long-term vision is to spread what they are doing in Kenya, into other countries. CNN Top Ten Hero, Evans Wadongo, and Oscar Award winning actress Halle Berry during the All Star tribute show in Los Angeles, Carlifornia in November 2010. Inspired by Wadongo’s work, the international community had honoured him as he was one of the nominees for the CNN Heroes for 2010 (Click here to watch his video). We at Ek Titli see this as an effort in the right direction to make the world a greener, cleaner and safer place to live in. We hope you do too! 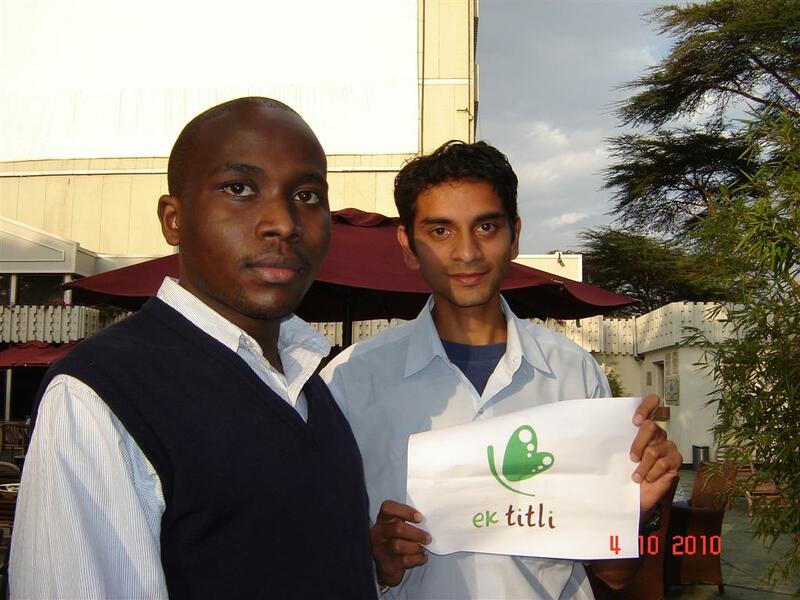 Deepak aka Dex, is a professional pilot who hails from Nairobi, Kenya. His interests include Poetry, Photography, Traveling and Art; not to forget football, which can be called his religion! He likes meeting new people and anything that is focused on conserving ‘Green’, is something which can be assured his support. All prizes has been sponsored by Srishti. Please click here to know more about them.